Domhnall Gleeson is Jon, a young wannabe keyboardist who manages to get recruited into an outré band called The Soronprfbs. The group is led by an enigmatic personality named Frank who wears a giant cartoon papier-mâché head that he never takes off. The gang includes Clara (Maggie Gyllenhaal) a supremely negative individual who plays the theremin (natch), Nana their drummer (Carla Azar of experimental LA act Autolux), petulant lead guitarist Baraque (French actor François Civil) and their manager Don (Scoot McNairy). Despite having little to no talent whatsoever, Jon desperately craves mainstream success. Meanwhile the rest of the band appears to have less focused aspirations. His dream of appearing at Austin’s famed South by Southwest (SXSW) festival is driven by his social media campaign via Twitter and YouTube. The production captures the collaborative efforts of an unknown indie band with real authenticity. There’s a reason for this. The inspirations for Frank are actually more interesting than the film itself. The screenplay was written by Jon Ronson and Peter Straughan, and was based on Ronson’s experiences playing in the new wave act Oh Blimey Big Band during the late 1980s. Their leader, Chris Sievey was an English musician and comedian. He succumbed to cancer in 2010. Sievey’s comic persona Frank Sidebottom included wearing a large spherical shaped head made of papier mâché and dressing in a retro styled suit from the 1950s. Beneath that veneer, the writers have fashioned a bizarre fictional group that also owes an obvious debt to the talents of avant-garde individuals like Captain Beefheart, Frank Zappa and Daniel Johnston. Frank is a black comedy with a dark undercurrent. How dark? Well someone who has committed suicide by hanging himself from tree is presented as a visual joke. In another instance a man is suddenly hit by a car in a sonic surprise that virtually slaps the audience with a punctuated jolt. 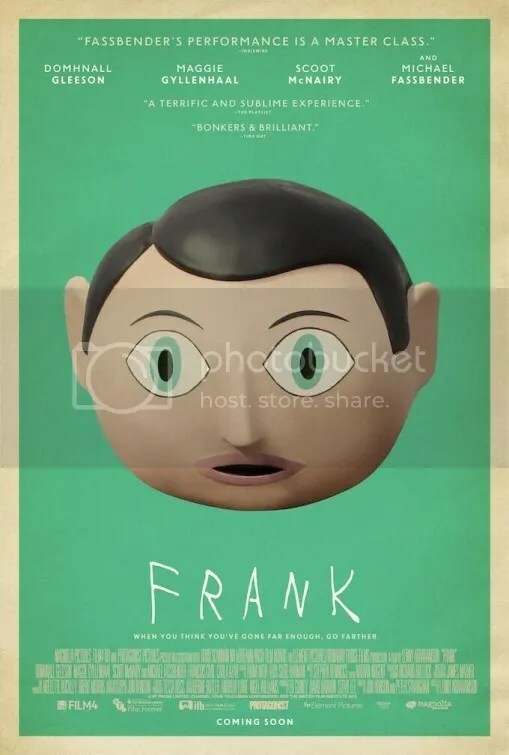 Frank is definitely an odd little film with a sensibility that will charm some and irk others. There are some amusing moments. Frank’s attempt at his most likable pop song is something called “Coca Cola, Lipstick, Ringo.” In the words of screenwriter Jon Ronson, it would be the result “if someone with manic depression tried to write a Katy Perry song.” The final ditty “I Love You All” is strangely affecting as well. Unfortunately those occurrences are few and far between. Most of the picture isn’t that funny or even particularly memorable. Frank isn’t a bad movie. There are some touching episodes amidst the bleak humor, but I’ll liken its appeal to food. Frank is a heaping plate of fava beans. There’s nothing wrong with fava beans. I just wouldn’t call myself a fan. I’ll take a plate of broccoli instead. This entry was posted on August 24, 2014 at 12:11 pm and is filed under Comedy, Drama with tags 2014. You can follow any responses to this entry through the RSS 2.0 feed. You can leave a response, or trackback from your own site. Agreed. Deliberately left-field and not everyone’s cup of tea, including mine. Frank has a strange set up with an even weirder execution, but it has a heart. Weird is good, but unfunny, unmemorable isn’t. You should still have high hopes. Reviews have been positive. When I listened to Frank Sidebottom on the radio 20 yrs ago, never did I think for 1 min a film wld be made about him! This is difficult: not sure I want to watch this. Question: is it REALLY Fassbender under the papier-mache? Ha! That’s a very good question. I completely echo those sentiments Mark. Didn’t quite get over with me as much the film, or even I, wanted it too. I do think Fassbender is outstanding in a tough role though. Ha, that would be amazing. Aw, sorry you didn’t like this! I do think the film fell apart a bit during its last act, but I still really loved it. Yeah I wish their performance at SXSW had gone….um……differently. I loved this. For me it felt like an interesting insight into mental illness. I can see how it wouldn’t be for everyone though. Making fun of something like mental illness is a difficult balancing act. It didn’t quite work for me but glad you enjoyed it. I didn’t feel like they were making fun. More that it was a bittersweet exploration of how it can be a creative driving force but is ultimately not something you can escape. This film intrigues me. I don’t know if I’ll find it’s brand of black comedy and exploration of mental illness interesting or offensive. On another note, how does one pronounce Soronprfbs? Legitimate question haha! It’s a very good question. The thing is, nobody knows…including the band! I have not seen this film and after your review I have absolutely no intention of ever viewing it. But your food comparison of what the movie Frank is like had me in stitches and has made my day. Thanks. wow. clearly this is not as it looks. Hmmmm…I’m intrigued. How does it look? I’ll also take broccoli over fava beans any day. Entertainment Weekly had this movie at the top of their Must List, so my curiosity was peaked, but it seems like you were less impressed by it. It just sounds like a really bizarre premise for a film, one that might be a bit too out there for me. I’m not sure I would find suicide or people getting hit by cars very funny, but who knows. I might check it out. It has gotten some good notices. However, Todd McCarthy’s take over at The Hollywood Reporter was closer to the way I saw it.